"This recipe takes just 15 minutes to prepare and 50 minutes of cooking time, but tastes like it took a lot longer. The recipe calls for chicken thighs because the meat is more tender than chicken breasts. You can use chicken breast if you prefer." Heat olive oil in a skillet over medium heat, and brown the chicken thighs in the hot oil, about 5 minutes per side. Set the chicken aside. In the same skillet, cook and stir the onion and mushrooms until the mushrooms have softened, about 10 minutes. Mix in the garlic, and cook until fragrant, 1 to 2 more minutes. Pour in the tomatoes with their juice, white wine, orange juice, rosemary, salt, and black pepper, and stir until thoroughly combined. Stir in the chicken pieces and any accumulated juices, cover the skillet, and bring to a boil. Reduce heat to medium-low, and simmer until the chicken is tender and no longer pink inside, 30 to 40 minutes. A sweet, tangy, and pleasant sauce. The sauce matures if you let it sit for an hour or two on the stove (with the lid on the skillet) after the initial cooking. Just reheat when you're ready to serve. It pairs very nicely with basmati rice, Caesar salad, and fresh Italian bread. With all the great rave reviews, I was looking forward to something really yummy. What a let down. Totally disappointed. No need to keep this recipe. This is #$^! @#%$ amazing. Had to use thyme because I didn't have rosemary, but followed the recipe exactly otherwise, and it was delicious. Worked great with polenta and parmesan cheese! 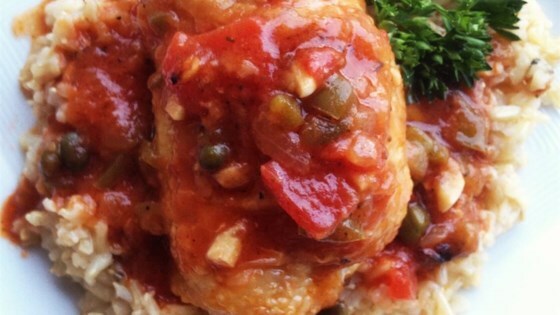 I love chicken cacciatore but my family hates peppers and any vegetables I try to slip in. This recipe is not only simple, but so flavorful! Everyone Loved it- even the picky kids! Great recipe! !